Improve workplace Productivity with Microsoft Workplace Analytics and MyAnalytics! – CT Link Systems, Inc. 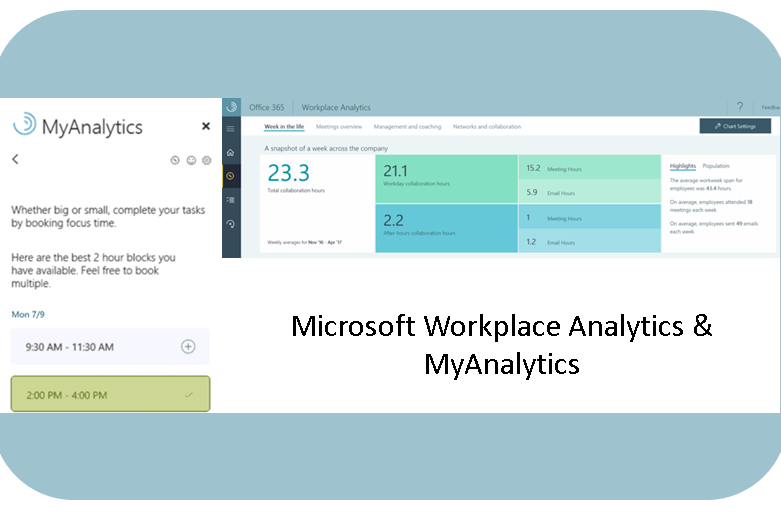 Improve workplace Productivity with Microsoft Workplace Analytics and MyAnalytics! Do you have trouble multitasking your work tasks such as meetings, appointments and other projects? If you do, Microsoft things that its data analytics tools may help you juggle these tasks. They have just recently announced that it will be enhancing their productivity insight products, Workplace Analytics for teamwork and MyAnalytics, so that they may better help put individuals and teams at the center of change. Through applied algorithms, Workplace Analytics uses data (emails, meetings, etc.) from Office 365 to identify patterns that affect your productivity, workplace effectiveness, and engagements. This allows upper management to enroll their respective team members into programs that will help them gain beneficial habits such as setting aside time to do solo projects or bring agendas to meetings. This helps the team progress toward their goals and tracking it overtime while giving members productivity insights and action plans through Office 365. Encourages you to practice good meeting habits such as asking a coworker to fill in for your if your schedule is too hectic. Workplace Analytics is now available on preview and MyAnalytics will be available soon. To learn more about Office 365, please visit our product page or call us at 893-9515 and we will be happy to help!